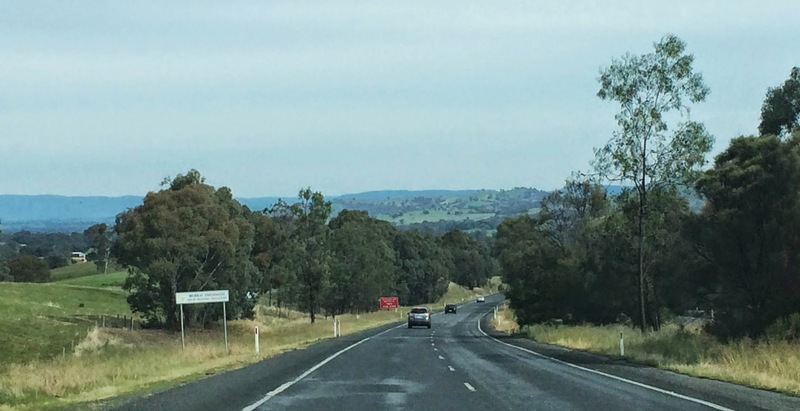 It had been only three or so months since I’d driven the road between Canberra and Melbourne, but the landscape looked so different. While previously the hills were an eye-piercing yellow, they were now a lush and rolling green. The rains had come and life had exploded which also had the unfortunate effect of increasing the number of Kangaroos about, and the roadside between Brisbane and Melbourne was dotted with the occasional former Roo. The driving was easy. Ruby’s alternator was holding out (later to be diagnosed as a slipping fanbelt) and the road from Brisbane had thus far been largely empty. It was the most chilled-out long distance drive that I had ever attempted. Steve and I plotted out a few towns between Canberra and Melbourne for us to visit on our typewriter Safari, and while there were a few interesting spots to tour there were very few typewriters. Our first spotting for the day was of a largely uninteresting Litton manufactured Royal. At $30 I was inclined to simply live this unremarkable machine exactly where it was. Sure, it was in good condition, but it was still a case of too dull – to unremarkable to bother with adding to my stockpile. The store keeper warned us that students usually pick these up really quickly. However we left that typewriter and the town we found it in behind in a cloud of dust, and headed on to Gundagai. 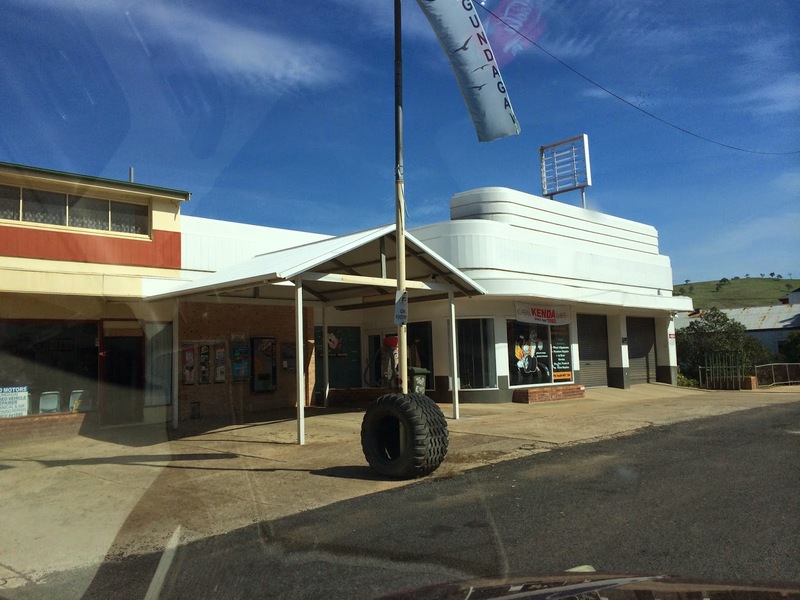 There’s two things that make Gandagai stand out from the rest of the towns in the area. 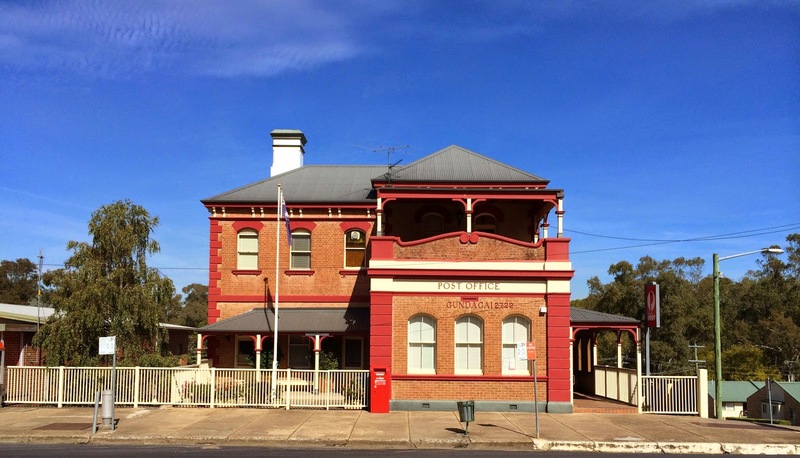 Firstly it was made famous by the country musician Slim Dusty in the song ‘The road to Gundagai’. Secondly, it is also famous for the statute of a dog sitting on a box that is known as ‘The Tuckerbox Dog’. Both are things I personally couldn’t care less about. The town is historically interesting in other ways. Many of the buildings were relocated from a section down hill that flooded in the early 1900’s that resulted in a few deaths, and the loss of thousands of head of cattle. The town shows signs of the explosion of rural finance in the early 1920’s and the collapse that followed the great depression. Now it is a sleepy tourist backwater with a long bridge that has suffered through many floods, but has some interesting Art Nouveau and Art Deco architecture. But it feels empty and withered. The glory years seem far behind. We found a couple of blips on the map that indicated the possibility of second-hand goods and antiques, so we pulled off the highway to investigate. One particular place yielded a lot of potential; it was a huge former theatre that was stacked full of interesting bits and pieces. “Naaaaaaarp” said the man at the desk when Steve asked him if he has any typewriters. “The students from Canberra pick them up as soon as they arrive. You’ll never find any”. And he was right. 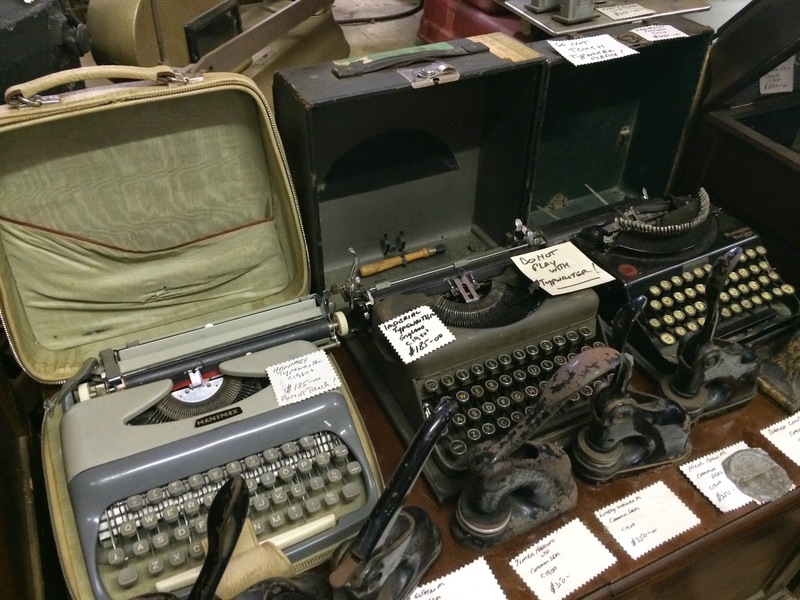 With the exception of the Royal we spotted earlier, not a single typewriter was to be found anywhere, and we got similar answers at other locations that we enquired at between Canberra and the New South Wales/Victoria border. It seems typewriters are all the rage with the students at the Canberra universities, and it wasn’t just Rob and Jasper that had plucked the landscape dry. After lunch we pushed on to the city of Albury. Steve took over the driving for a bit, and attempted a bit of a sleep in the passenger seat. But I didn’t really, and I found myself just looking out the window at hundreds of kilometres of green farmland rushing by the car. We pulled off the Hume freeway at Albury, and made straight for the hunting locations that we had plotted out on the map. But the town was a bust. Either the stores we went to were closed and didn’t show any real potential, or were clearly not worth our time. We didn’t stay long; and we were there just long enough for Steve to find himself a chocolate bar to quell an unexpected craving. Soon we were back on the road again. The Murry river slipped below us as we left Albury and entered Wodonga (the towns are now considered one big cross-border town called imagintively Albury-wodonga) via the bridge that crossed the water. We were now in Victoria. We didn’t have many more places left to look at, so we were a bit despondant that our typewriter hunting efforts were about to come to a somewhat unsatisfactory close. 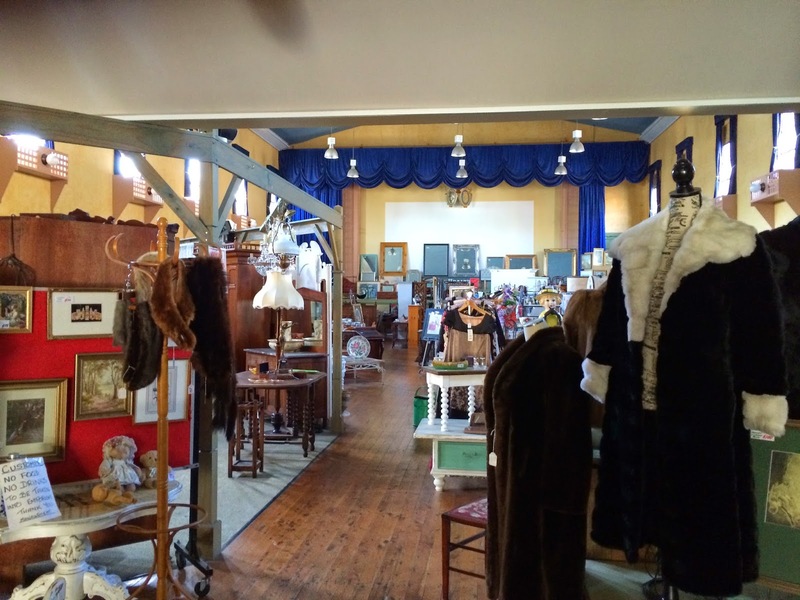 We diverted away from the freeway and took a few back highways in the direction of Melbourne in the hope of finding one last treasure trove. 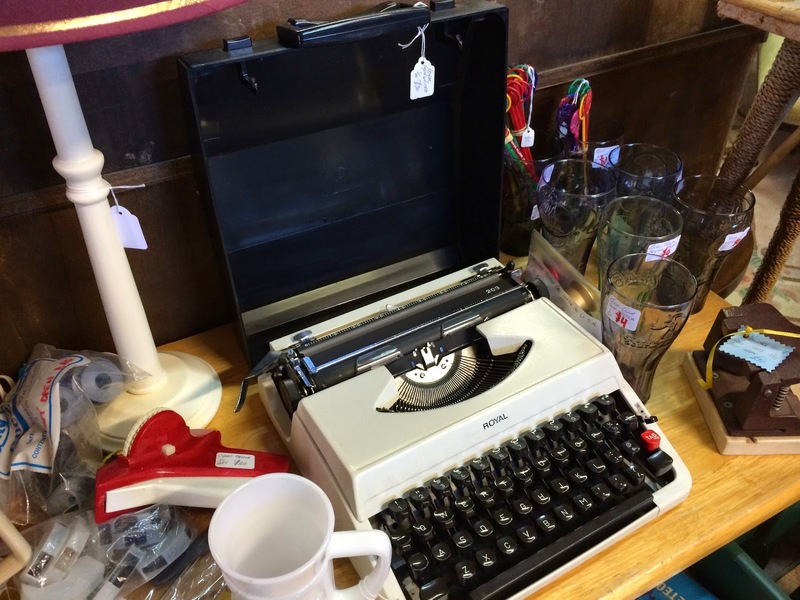 The first shop we found did have a typewriter. It was an over-priced electric Brother that found love from neither Steve nor I.
I had so little passion for this machine, that I dropped the lid back down and photographed it as it was. We once again enquired about other typewriters. The shop’s owner gave us the same story about Canberra students snapping up all manual machines, but he could get his hands on another electric machine if we were interested. We weren’t, and we bid the grumpy owner best of luck as we walked out the door. The next shop we visited really was something of a treasure trove. The owner was even grumpier than the previous store, and he walked around his dangerously over-stacked shelves barking at customers: “Haven’t you go a home to go to”. At one point he turned to me and said “These customers are dickheads. I just over-price everything to piss them off”. He was a short man with a long grey beard and was wearing a very worn boat captain’s hat that somehow seemed to match his thick glasses. There was a particular cheekiness to his tone that told me that this was part of the game of shopping in his store. “Oh? So, you are inclined to a bit of a haggle” I inquired. “Of course I bloody am” he laughed. “I don’t know what happened to people these days, they just take everything of face value. They’re stupid”. And so it was on. This was one smart owner. You didn’t just go into the shop for the remarkable over-supply that could potentially topple onto you at any moment and kill you, you went there for the banter with the owner and the thrill of discovery. I went looking for depression glass, and found some at the bottom of the cabinet. “This isn’t depression glass, you don’t know what…” he started before I interrupted what was no doubt going to be an insult. “Oh, so that isn’t uranium glass”? I rhetorically asked as I pointed at the items at the bottom. He paused, and I saw his expression change. “How did you know that was uranium glass”? His mood shifted, and soon he was showing me all the depression glass he had strewn across his shop. Nothing was of interest, but I had spied two Italian made art deco desert bowls of a slightly different era, and I asked him for a price. “Make me an offer so I can laugh at ya” he said. So I did. I offered him less than half the price he had marked on them. He grumbled a bit, and I just gave him an assertive smile before he said ‘Yeah, ah… yeah okay”. And the deal was done. 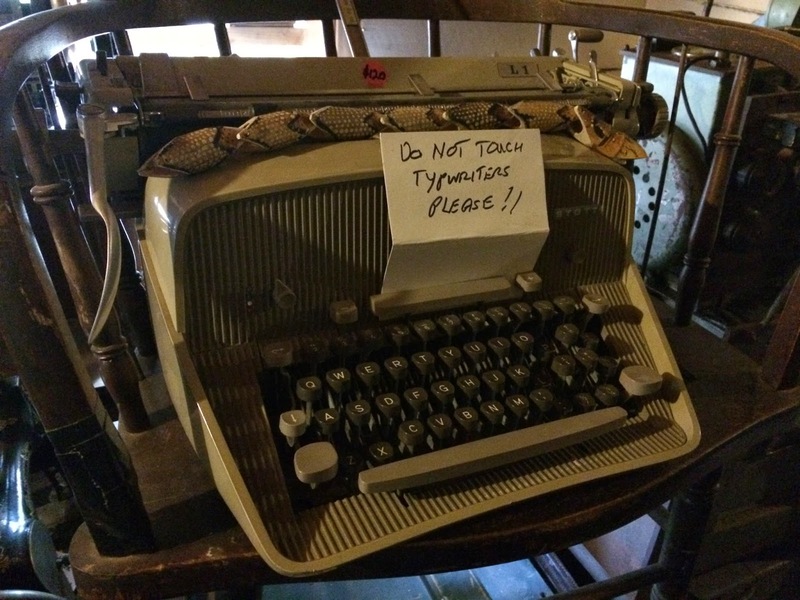 Steve and I picked through several rooms looking for typewriters. We found some almost immediately on entry, and dismissed them outright because of their price. I had yet to have that aforementioned conversation with the owner, but even then these machines were, in my opinion, way, way out of the playing field on price. They were in fair condition and all, but I had no love for the Hanimex and the Imperial. I also already had a Remington Portable on its way to me in the mail already that had the potential of being a fair nicer machine. I headed out to a couple of connected sheds that were partially exposed to the elements. 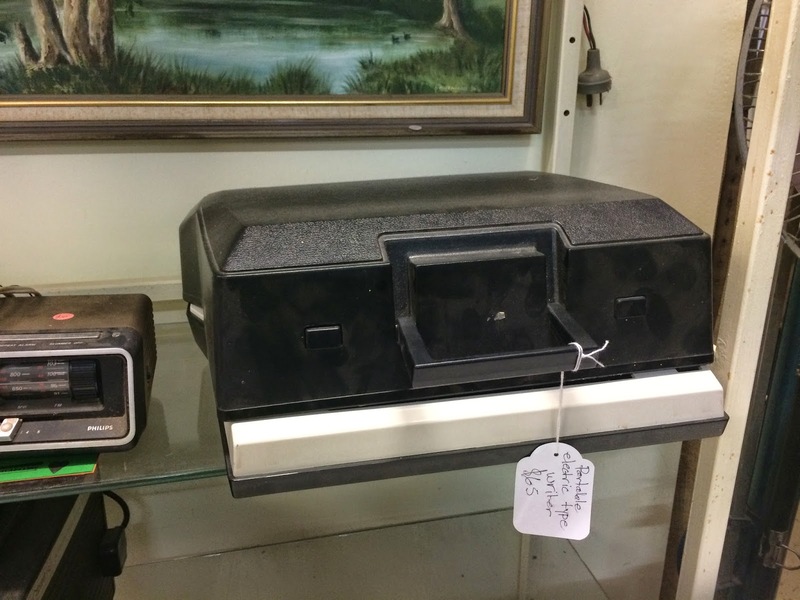 I’ve had some success finding machines in back rooms like these in the past, but my heart sank as the collective of material here was so hap-haphazardly stacked that anything could be interest may be buried beneath mountains of crap – never to be seen. And that is how I found my first major discovery. 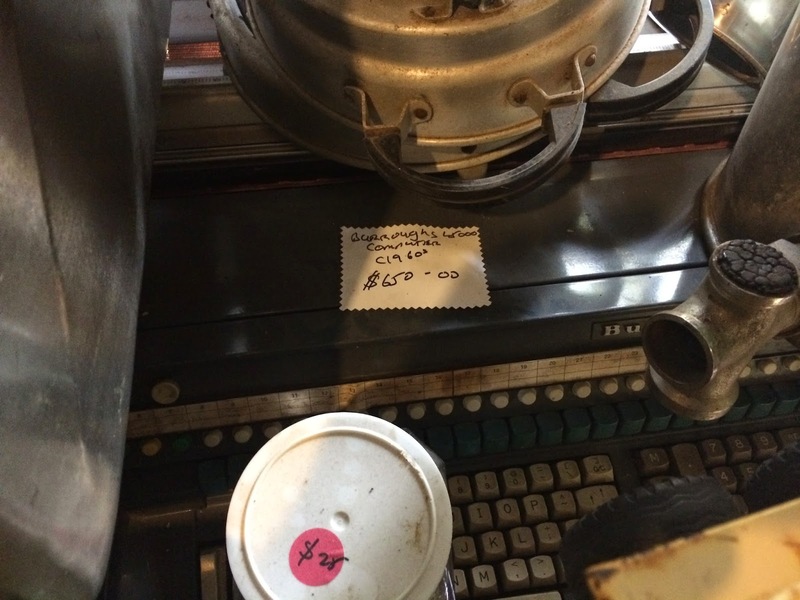 Between heavy items I spied a plastic keyboard and a gap at the top of the machine with a plastic window lined over a platen similar to that on the Selectric. But the machine had a rather elaborate numbers pad. I shifted some small bits aside that covered the keyboard and spotted a name plate that started with B. The name was familiar but the machine wasn’t. I shoved my camera between gaps in heavy items to take a close photo of the name. I then shifted some more stuff and then saw the price. Yeah. At $650 I was inclined to leave it right were I was. 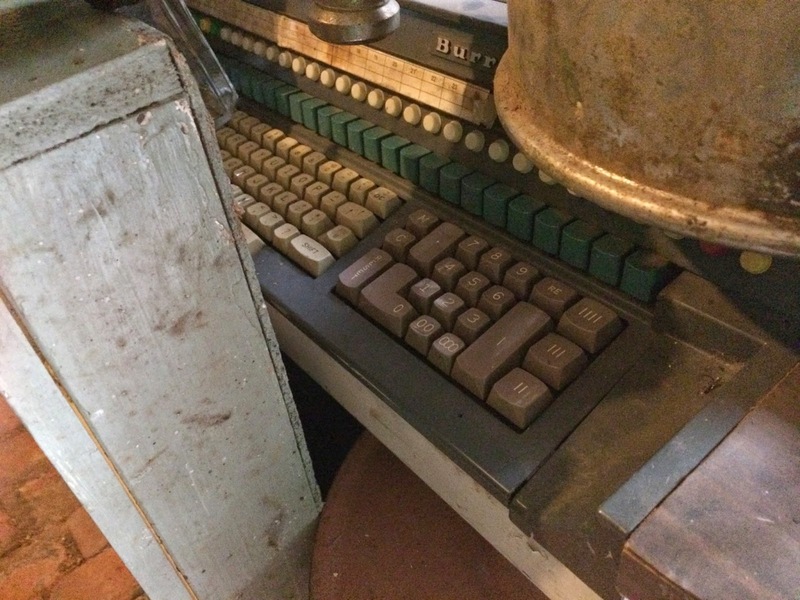 This is a Burroughs computer. It is a bit of a missing link between the electric typewriters of yesteryear, and the computers of today. These aren’t exactly common machines, and I honestly wouldn’t know what to do with it if I had one. There should be a bar fridge sized box that the typewriter part connected to somewhere, but I didn’t spot it on the day. 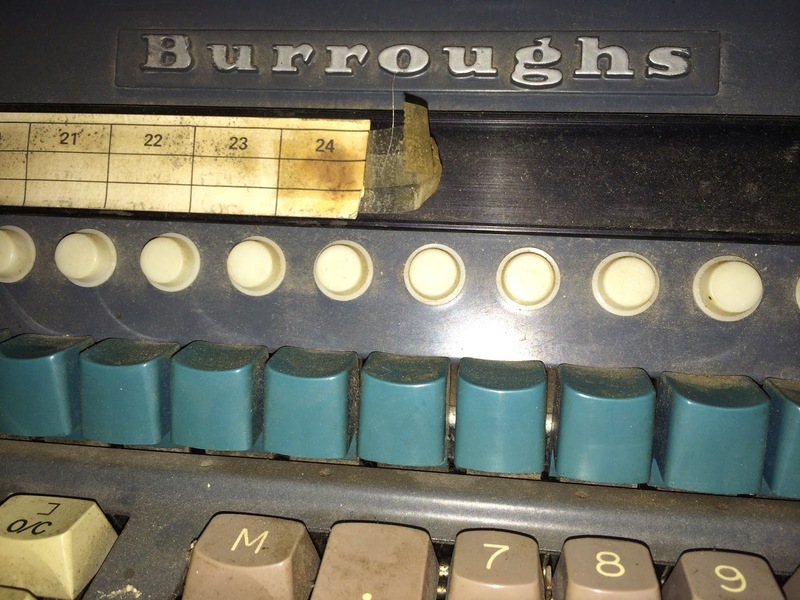 Here’s a photo I found of a Burroughs computer not buried behind a mountain of junk. The Burroughs at this store sat in an integrated steel desk that was painted an industrial looking blue. The keyboard was flanked by wood similar to the machine depicted above, but wasn’t so elaborate. I’d seen such machines before at La Trobe University in Melboune in the 80’s, and even then they were relics that were more curiosities than teaching aids in the uni’s computer lab. So I moved on from this machine, and soon found myself face to face with something I had never seen before in anyone’s collection. Ted’s typewriter database has a category for this machine, but nil information on it. In fact, after considerable effort I have only found tiny pieces of information thus far on this typewriter. Meet the Stott model L1. Please ignore the toy snake on the top. That seems to be there simply to guard the machine from people wanting to actually…. type. Priced at $120 (probably negotiable) this standard looked impressive but still pricey. I might have even made an offer for it, but sadly I had no room left in the car. I considered getting Steve to sit on top of the machine for the rest of the trip. It was made with a thick shell that could take a hit from a rifle and survive, so I’m sure it would have been safe under Steve. However it would have made for an uncomfortable couple of hours. However it had me scratching my head. The Stott name was familiar, but this typewriter sure wasn’t. There were design features on this machine that I had never seen before. 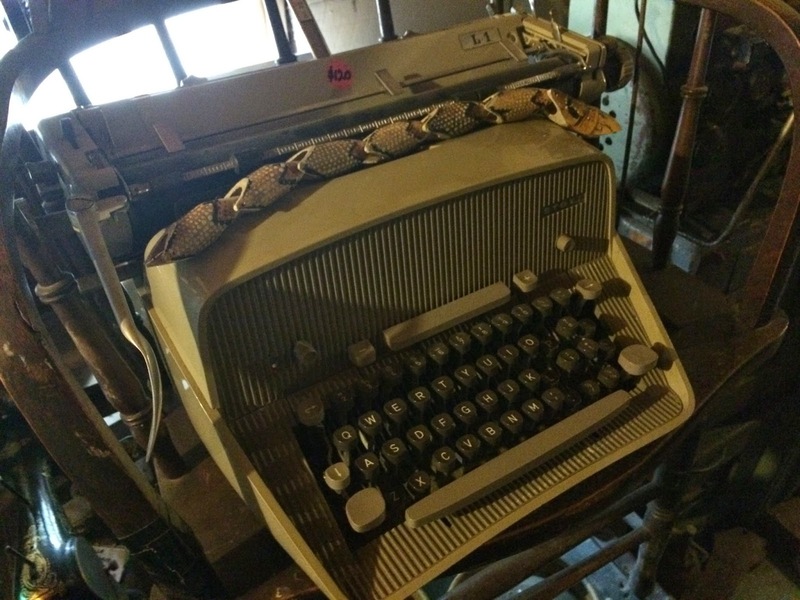 The space-bar was carried over the shell of the typewriter with the he ribbon cover slotting down into the same shell. The corrugations on the façade also was very foreign. It sort of… looked… similar-ish to an Adler universal, but it wasn’t. Part of the machine reminded me of earlier Olympia desk-tops, while the keyboard was closer to the Adler’s design – but substantially different enough to strongly doubt that it was from the same manufacturer. Confusingly it has the fawn and beige colour-scheme of the 50’s era Grundig made Triumphs. I just can’t place this machine with absolute certainty. Well, it is a re-branding of some kind, but whatever it is, it has been significantly changed from the base machine that it came from. Even the carriage set-up and platen knobs don’t match anything that I googled a look at. What I can tell you is that the machine was sold by Australian company Stott & Underwood. 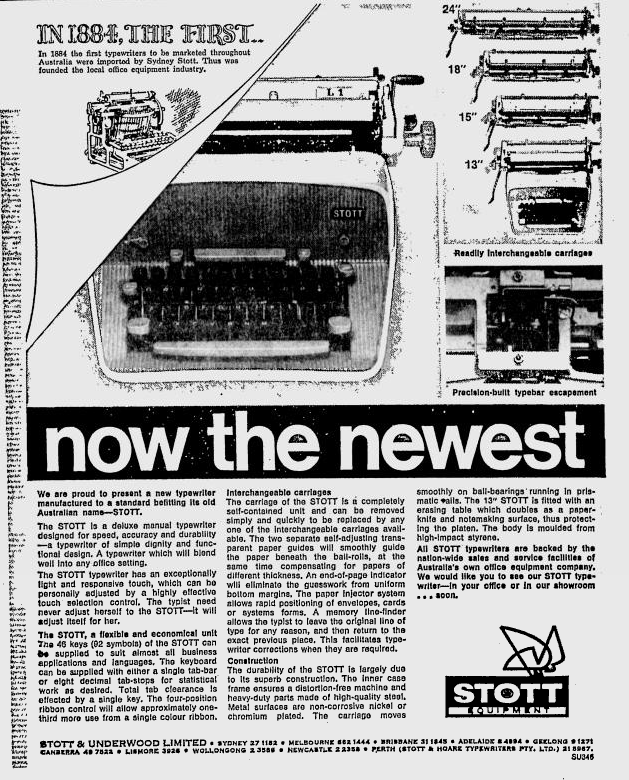 Rob Messenger did a significant write-up on the history of Stott some time back, but didn’t mention any machines made specifically for the company. At the end of his article he had exhausted himself before he exhausted his material so there may still be something. How do I know this? I found an advertisement for this machine. Stott placed a large advertisement in both ‘The Age’ newspaper in Melbourne, and the ‘Sydney Morning Herald’. It was placed by a company called ‘Stott Equipment’, but the advertisement in The Age showed the company as actually being located at the ‘Stott Underwood’ offices in most of the major Australian cities. see the bottom of the advertisement below. These advertisements appeared in both of these newspapers, on page 3 no less, on the 8th of April 1969. So I think we can confidently place these machines as being manfactured around this time (Ted, want to update your Stott section of your database?). This was 3 months after Litton had just purchased Adler and Triumph of Grundig. No major structural changes had been done to the company by this stage, and Litton weren’t using Adler’s design to produce a variety desktops yet. .Adler and Triumph were certainly still producing machines in Germany. 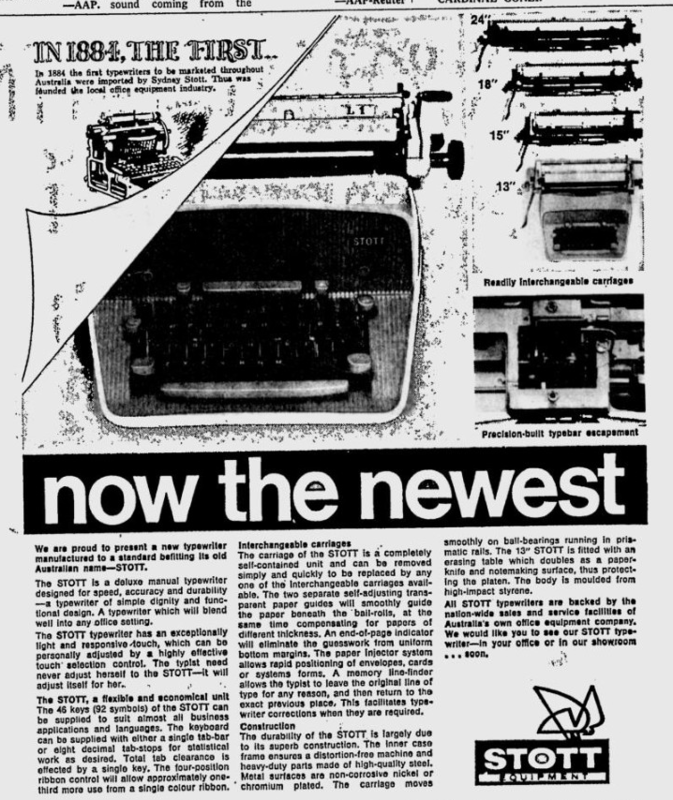 Underwood however were part of Olivetti, and Olivetti was at the time a very strong brand. However Royal, a manufacturer that Litton already did own along with Imperial, were pretty much considered near dead. 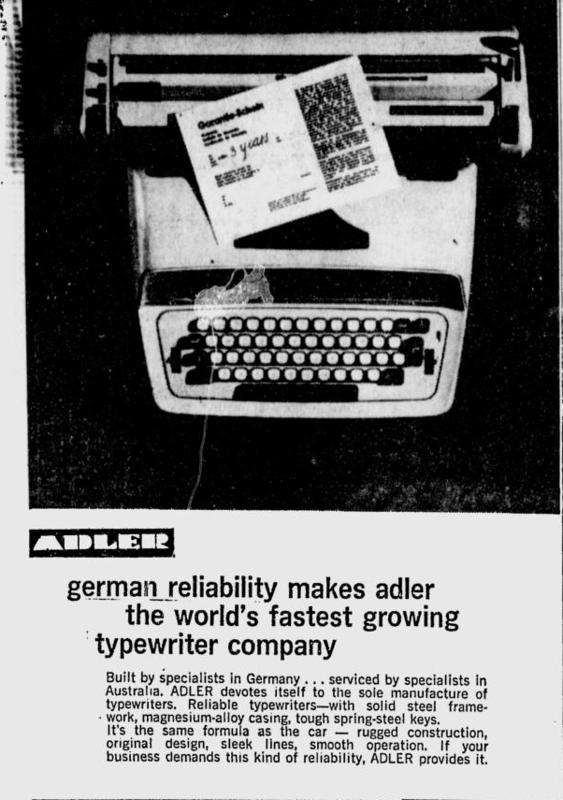 On the same day Stott advertised this machine, Adler proudly placed a similar sized ad one page over marketing their newest machine. It is an electrical beast that I have still to lay eyes on personally. The Stott disappeared from view in the newspapers almost immediately, and there’s no other reference to this machine to be found in the papers of the time. The company that sold it had at the time only just been sold to another company, and was re-structuring to become which is now known as the Stott business college in Melbourne. The machine seems closest to the Adler designs of the time, however it is far from certain that they manufactured this machine. The origin of the machine still alludes me, and I think it had a very short life during a tumultuous business period. So what do you think? Steve and I loaded back into Ruby for the last stretch of road back to Melbourne. Our journey was about to come to a close. ← Politics and typewriters in the halls of power. Ok, put up a gallery with these pics (don't suppose you got the serial number off it?) and link to your post here from the gallery. I'll use that to update the Stott page. No problems. I'll do it when I get back home from work. Siemag! (It looks exactly like one, with very little modification. I can't find a photo of it online, but take my word for it.) When I read Wilfred Beeching's book years ago it struck me as being a particularly attractive machine. I think there was some relationship with Litton and Portugal at this point of production. AH! Looking forward to seeing that photo. Now we're getting somewhere. I seem to think it might have been also been branded an ABC or AMC or some 3 letter acronym starting with A… I wish I had a copy of the book to scan from and show you. Rob might be able to come to the rescue. Some impressively ugly and collectable monsters! This is the closest I can find—notice that the function keys are the same, including the two knobs on the front surface of the machine. Ahhh yes, I agree. I can see it. The configuration is quite close. I agree, I think you're right about it being the base machine. Agreed. 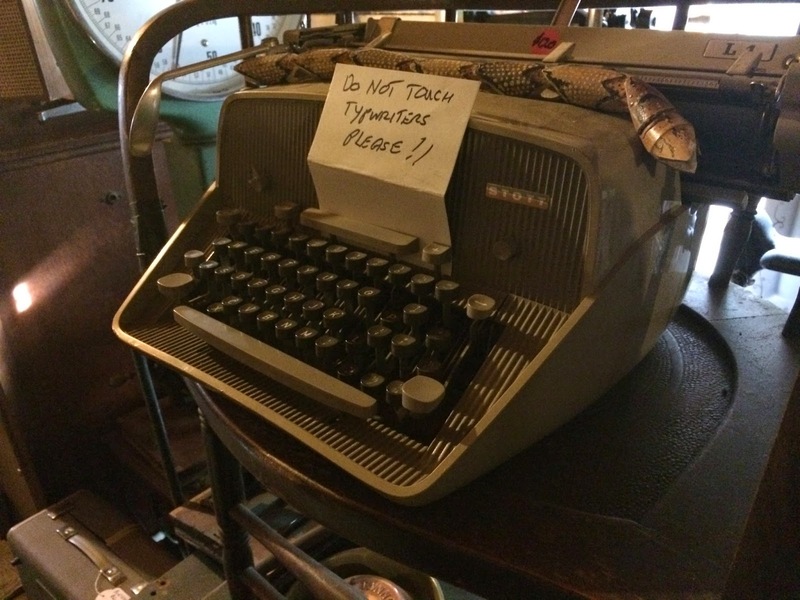 Kinda the evidence that not all typewriters are art. Berluddy eBay. Makes typewriter price experts out of everybody. Way too pricey, but the students snap them up. Apparently. Agreed. And that is a whole massive topic on its own. Yip, I am inclined to agree with Nick on this one, I seemed to remember fixing a few of these in Melbourne during the late 60's – early 70's… I also repaired/serviced Seimags as well. My friend Ken Cinquerana was the service manager at Stott & Underwood and after they closed he took over the running of Ames Agency in North Melbourne. Looking back, it was possibly a last gasp from S & U to stay in business after Underwood were being gradually closed down by Olivetti. As far as I remember the Stott/Seimag was not such a bad typewriter, I would like to have one in my collection. ok, I've jiggered Stott to be a Marque of Siemag. You have found some nice pieces of history there. I love that Burroughs computer. Know just the place to put it and get it back to work again. An amazing beast! I only know Burroughs from their calculators. The Stott/Siemag is incredibly ugly, but then again an amazing find!